We often use the term “frequency matching” in our daily life to define compatibility. Our frequency does not match, we do not get along? We are not in sync? We are not on the same page, etc.? When people of similar frequencies (wavelengths or within the same range) come together – output is not a simple sum of individual work, but exponential. In science we term this phenomenon as resonance. Output at this stage is beyond any logical limit. Three young kids, with different family backgrounds and outlook meet during their graduation days at IIT-Bombay campus and become close friends. Although, individually they are in sync, but the same is not true for their interaction with the world. How will their relation withstand the conflict of family and society pressure? How do their characters shape out, as they traverse from an educational environment through the corporate world to the realm of the social-political world? 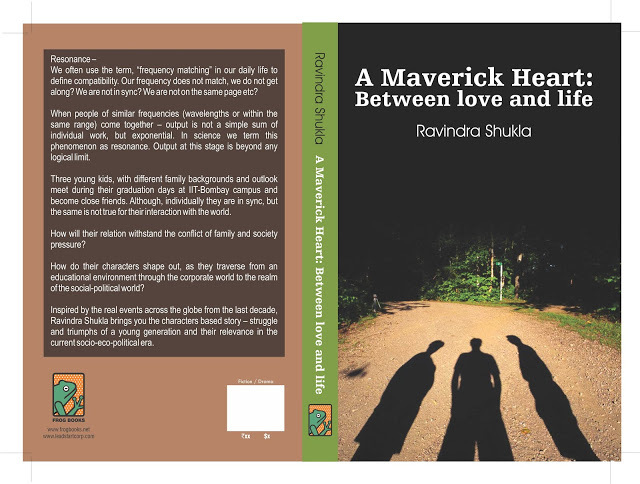 Inspired by the real events across the globe from the last decade, Ravindra Shukla brings you the characters based story – struggle and triumphs of a young generation and their relevance in the current socio-eco-political era. Ravindra Shukla is a graduate of IIT-Bombay. He works for IBM in emerging technology and business analytics in IT software technology. His professional experience includes working with consulting firms – PWC and IBM in USA for 15+ years. He is a member of the Film Writers Association, Mumbai. His interest includes – writing fiction, literature and movie scripts apart from sports, movie and travelling across the globe. The beauty of the story lies in the fact that the author has restricted his major characters to three – Rahul, Neerav and Richita. All these characters are college going student. They have brains because they study is IIT – Bombay. They are multi-talented because they play sports. They are well-read. Their parents are well literate and act as a backbone to each of their moves. This fact is further emphasized in this book. These three characters are highly influenced by their familial roots and their own personal experiences. They evolve as characters and such transition is slow and eventual. The book is a pleasant read. And it is different from many of the IIT stories that we have read. The characters here are more focused. Their campus life is not restricted to vodka shots, girls, love, girls’ hostel or bunking classes. The characters in this book seem to be more real and relatable. They study and they have fun too. They study in a premier institute like IIT and the characters stand to the value that the institute carries. And I loved that. The narrative has dates along with it. Therefore it seems as if we are reading a few pages from the diary of these character’s lives. Also it makes us aware of the fact that the story is spanning over a long period of time. I particularly loved the transition characters and the choices they make. The plot carries tons of positivity! Everything said the book is a slow read. Maybe because of the lengthy timeline... Maybe narrative is too detailed... And the book is nearly 400 pages. Some editing would have done wonders to the book! There are two things that draws a reader’s attention, especially when it is a first time author! i. The excerpts – It was promising enough. And I opted to read it ONLY because the plot seemed REALLY interesting! ii. The cover page – A colorful or innovative cover-page is an assured show stopper. But the cover page of this book is really boring! It could have been made much better. Cover page is like make-up for a beauty. It only adds to the beauty that she already has! Why not? This book is a no-non sense book. Yet time well-spent I would say! This book review is a part of "THE READERS COSMOS BOOK REVIEW PROGRAM". To get free books log on to thereaderscosmos.blogspot.com.